Aaron Baker’s one-in-a-million journey started with learning to do just one thing, beginning with getting just a few muscles in an arm to work, and then moving on to another task. LOS ANGELES — The worst day of Aaron Baker’s life wasn’t when the then-20-year-old professional motocross racer crashed his bike in 1999, flew over the handlebars and hit the ground headfirst, paralyzing him from the neck down. No, the worst day came a year later when Baker’s physical therapy ended. That was when his therapists, marveling that he could stand on his own and move his arms a bit, cautioned him not to expect much more. The chances of walking again, he was told, were one in a million. He eventually used that as a mantra — when people say odds are a million to one, ignore the million and focus on the one — and has learned to walk again. It started with learning to do just one thing, beginning with getting just a few muscles in an arm to work, and then moving on to another task. “At first it was even one in a million that I would feed myself, so walking seemed out of the question,” said Baker, who recently completed a leg in the international Wings For Life run to raise awareness of spinal-cord research. “So after a time we learned to focus on just the one. Our approach to the whole process became just one breath, then one movement,” until small victories began to add up to the larger one. Baker, 36, who now gets around with just a cane, emphasizes that he didn’t run far during his leg at last month’s event; maybe just a quarter-mile. He walked 20 miles across the Mojave Desert last year for a documentary, tentatively titled “Coming To My Senses,” that a friend is doing on him. In previous years he bicycled across the United States — twice. “I was ready to drive my electric wheelchair right into the swimming pool” at the modest motel that he’d first moved to. A year earlier, he thought, he’d been a hotshot racer who had landed a professional sponsorship. Laquita Conway had her own idea about his future. She took him to the Center of Achievement Through Adapted Physical Activity, an institution at California State University, Northridge, (CSUN) known for its pioneering work in developing rehabilitation therapies. She’d heard there was a kinesiology professor who had had some success in working with people with spinal-cord injuries. For 15 years, Baker went to see Taylor-Kevin Isaacs, the former CSUN professor. “When Aaron told me he thought he had a one in a million chance of walking again, I told him, ‘Let’s think of grabbing onto the one and forgetting about the million,’ ” Isaacs said, recalling their first meeting when Baker struggled just to shake hands. He didn’t make too many promises beyond that, but put him on a regimen stressing nutrition, flexibility and repetitive exercise. “But the key part is human determination,” said Isaacs, adding he’d never seen anyone with more determination than Baker. Baker credits most of that to his mother, who wouldn’t let him roll into that pool on the first day or let him quit exercising on any day afterward. For her part, Conway said she never envisioned her son walking 20 miles across the desert. She simply wanted him to get better. “We just knew that if we didn’t pursue aggressive therapy, all the prognoses would remain correct and Aaron would remain a quadriplegic,” she said. There is no magical cure for an injury like Baker’s, in which he fractured the fourth, fifth and sixth cervical vertebrae, said Dr. Charles Liu, director of the University of Southern California’s Neurorestoration Center. None of it was easy. It took Baker five days to walk those 20 miles across the desert last year. When he bicycled from San Diego to Florida in 2007, he rode a tandem bike with his mother. These days he pedals a home-built three-wheeler. “I can ride a two-wheeler, but it’s not safe for me stopping and starting,” he said. When physicians rebuilt his body, some of the nerve roots on the right side were jettisoned, leaving him with balance problems. He has an even more ambitious goal in mind for next year: climbing California’s Mount Whitney, the highest peak in the continental United States. 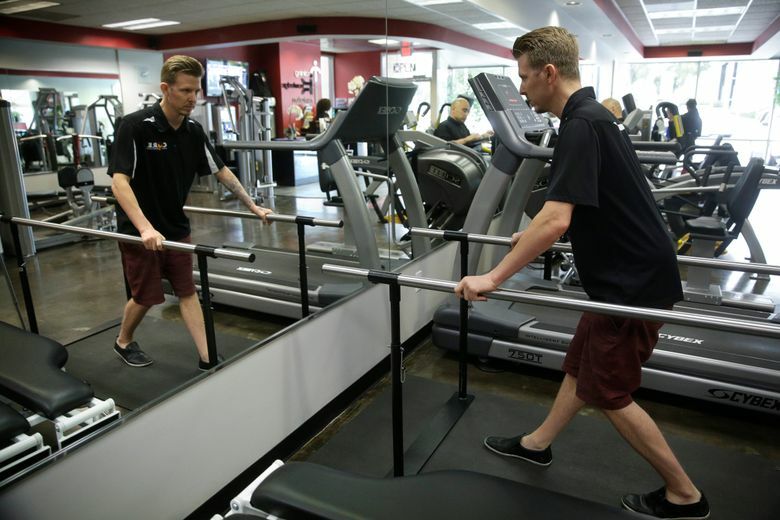 Until then, he keeps busy at the Center of Restorative Exercise, the small gym designed for people recovering from spinal-cord and other debilitating injuries that he, his mother and Isaacs opened in 2011.